India, February 28, 2017 – Ducati Corse, the racing department of Ducati Motor Holding, a world leader in sports motorcycle manufacturing, is working with Accenture (NYSE: ACN) to integrate Internet of Things (IoT) and Artificial Intelligence technologies into the testing of its MotoGP racing bikes. 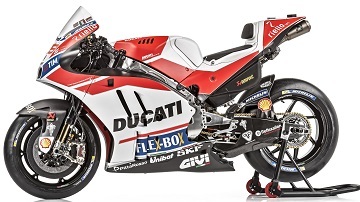 Ducati Corse wants to make testing its race bikes faster, cheaper and more effective. Accenture Analytics, already Official Digital Partner to the Ducati Team racing in the MotoGP World Championship, has lately been working with them to create an intelligent testing approach with a bespoke analytics engine. Integrated Machine Learning technologies mean that the more data that enters the system, the more configurations are available for testing with increasingly accurate performance predictions. Data visualisation tools designed for an intuitive user experience will allow testing engineers to interact with insights, tweaking them at any point to create a new perspective on configurations and race times. This will provide more results from fewer on-track testing sessions, saving the time, money and effort previously required for testing, and creating bikes that become smarter with every test run. “There are 18 MotoGP tracks, and to make sure our bikes perform to their limit, we need to test as many configurations and scenarios as possible,” said Luigi Dall’Igna, Ducati Corse General Manager. “So far, we’ve seen excellent results in the lab with the Accenture solution. The ability to use existing and new testing data will help us choose the optimal configuration for our bikes. This innovative tool will make our testing a more intelligent process, helping us get the best performance from our bikes, whatever the weather or the track.” Using data from up to 100 IoT sensors on the bikes and existing testing data, the Accenture solution will allow team engineers to create new perspectives by simulating and assessing bike performance under a range of conditions. By applying advanced analytics and machine learning techniques, simulated results based on data from previous tests run on real-world tracks will allow engineers to learn from and act on the data to optimise bike configurations for any MotoGP race. All of this intelligence is delivered at new speeds through an intuitive dashboard, enabling new dialogues and collaboration across the team. More potential configurations than ever before can then be tested, maximizing the benefits of on-track testing and gaining competitive advantage for race day. “With this solution, Ducati Corse can operate an intelligent testing program to help deliver better race results,” said Marco Vernocchi, EALA Lead of Accenture Analytics, part of Accenture Digital. “By simulating and monitoring a motorbike’s performance under a vast array of track and weather conditions, we’ve been able to apply machine learning integrated with IoT sensor data, to help minimise the time, expense and effort of traditional on-track testing. Ultimately, we hope this innovative solution will help the Ducati Team stay ahead in every race they compete in.” To date, around 4,000 sectors of race tracks and more than 30 different racing scenarios have been analysed, with a wider roll-out of the solution expected. In testing, data such as engine running parameters, speed, revs and tyre and brake temperatures are collected, and the Ducati Team will use this to plan, prepare and test for MotoGP races.